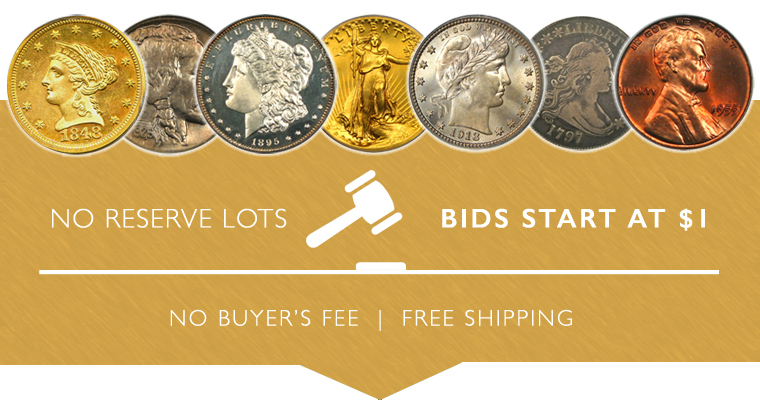 Auction #990 Lots Posted Browse & Bid Now! Our first highlight selection is an 1855 $20 PCGS MS62. Looks like a MS63! A very scarce date that you never see in high grades. In fact, only two pieces are graded finer by PCGS. This week's second highlight selection is a 1776 Continental Dollar $1 PCGS VF35 (CURENCY, Pewter). In the third edition of The Top 100 Greatest U.S. Coins, the 1776 Continental Dollars ranked 10th. A fascinating issue as the origin of these coins is not clear, except that it was likely rooted in the desire of the Continental Congress to issue a monetary medium of exchange. Issued in 1776, most of these examples were made of pewter as silver was not affordable to the fledgling government. Likely struck in three different cities, New York, Philadelphia, or Lancaster, PA, these are very popular due to their association with early America and the Revolutionary War. This week's second highlight selection is a 1799 $5 NGC/CAC MS61 (Large Stars Reverse). Flashy surfaces with fantastic eye appeal. A popular early $5 that rarely enters the market, especially with the CAC seal of approval. Of course there are many other highlights, so be sure to browse all lots in this exciting new sale before it closes on Sunday, December 10th.